Over five hundred years ago, four Tahitian wizards, Kapaemahu, Kahaloa, Kapuni and Kinohi, journeyed to Hawaii to share their healing practices and traditions with the Hawaiian people. When it was time for the wizards to return home, they asked the Hawaiians to select four symbols that would be erected in their honor to ensure that the healing powers would remain for generations. The Hawaiians selected four large boulders that were brought to the beach from the Kaimuki area. The wizards then spent time transferring their powers into the stones. These stones sit directly across the street from Nā Ho‘ōla Spa near the area they were left hundreds of years ago. 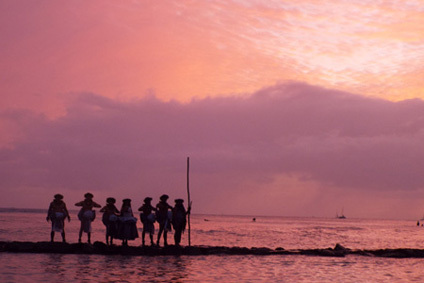 For centuries in Hawaii, the highest chiefs declared Waikiki a royal reserve. Natural land boundaries were formed by a number of streams that flowed to the ocean. One of the most revered land divisions was called Hamohamo. The royal retreat for the Chief Aikanaka and his descendants King Kalakaua, Queen Lili’uokalani, Princess Likelike and Princess Ka’iulani. It was believed that the waters spouting out of the ground here held healing powers. Thus, Hamohamo was reserved for and greatly respected by Hawaiian Royalty. Today this land, once named Hamohamo, is home to Nā Ho‘ōla. Traditionally ancient Hawaiians gave a name based upon their dreams or interpretations. Nā Ho‘ōla, meaning “many healers” was given to our spa by revered kupuna kumu Aunty Malia Craver. Her vision of Nā Ho‘ōla takes our guests on a journey to a land rich in history, culture, and healing. Four traditional Hawaiian healing plants make up our spa logo, Kalo, Noni, Kukui and Awa. These plants were vital to the ancient Hawaiians way of life and are found in many of the products that are used in our treatments. Nā Ho‘ōla prides itself on using the history of Hawaiian traditions and techniques in our treatments and incorporates signature products made right here on the islands.